For the first 10 days after returning from Florida, I was about as sick as I've ever been. And that's saying something, considering the number of times I was down for the count, and almost out, in South America. Our first visit to the beach was on the morning of our first full day in Florida, about a week before a major hurricane hit. There were no warning flags of any kind posted. We’ve visited that beach a few times - it has been one of our favorites over the years. We even used the same entrance and stayed at the same property as last time. 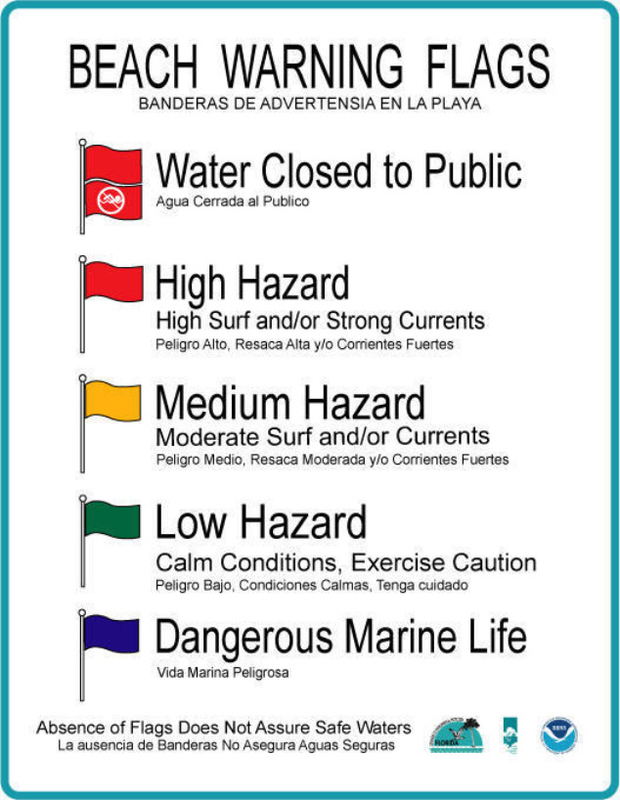 We are familiar with the location of the beach warning flagpoles which indicate whether the Gulf is too dangerous for swimming (red flag), or whether there is any "dangerous marine life" present (purple flag). All the warning flagpoles were empty. There wasn't even a "low hazard" flag flying - just nothing. There were also no warning signs posted about red tide. We stopped by the sign board on the entrance path and saw the riptide signs and the usual government signs and rules posted. I pointed one out to the kids, reminding them of what to do if they ever get caught in a riptide. Before we could reach the water, I began to cough. Before swimming, I spent a few minutes taking photos while the kids played in the surf. Meanwhile: more coughing. My throat also itched continuously. The moment I entered the water, my coughing got much worse. I also began to sneeze repeatedly. Within a half hour, several members of our family were coughing and sneezing frequently. There aren't any factories around here. The surf was pretty rough and I involuntarily swallowed sea water twice that morning (after crashing waves forced it up my nose and down my throat). The Gulf water burned my throat badly - moreso than I remember from any prior ocean swims in Florida, Peru, Maine, etc. As soon as I swallowed it, I instantly had the urge to throw up. But I glanced around and noticed that dozens of people would see it happening, and thought about how gross that would be, so I fought off the urge. Some of the kids also swallowed a mouthful once or twice, and they ran out of the water with tears in their eyes, and told us how the water burned their throats. Example Florida Red Tide Map of the Florida Fish and Wildlife Conservation Commission (FWC). Red Dots = Bad. 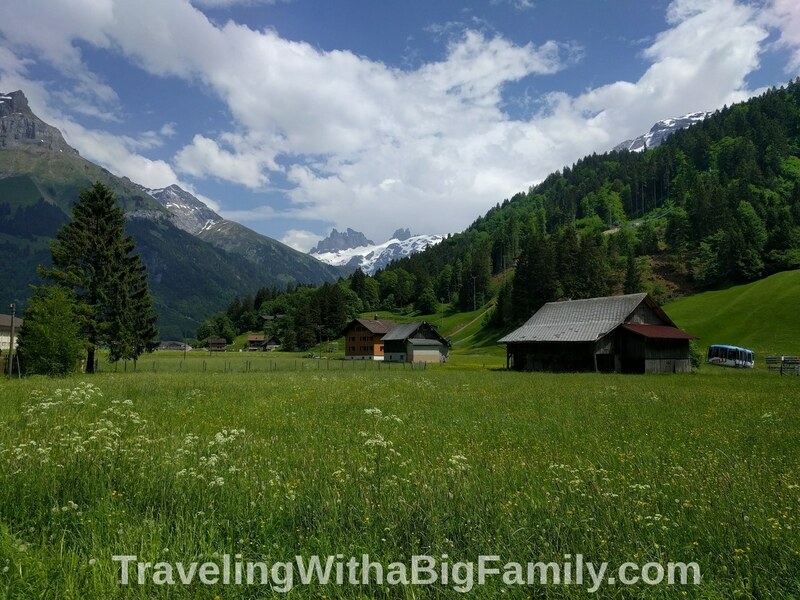 As more families began to arrive, we noticed that the coughing wasn't limited to our family. Nearly every person who arrived on the beach coughed repeatedly, before they could even set up their beach chairs or take off their flip-flops. We could overhear people making comments about “something in the air,” and saying things like, “my throat hurts.” We heard one family asking one another if maybe they should go back to the hotel. No one left, of course. If you come all that way to see the beach, what are you going to do? Go back inside because you coughed a few times? No way, right? Everybody stayed. Since the surf was so rough, I repeatedly checked the flag poles to see if any flags were ever going to appear. None ever did. We stayed about 90 minutes total on the first day, then returned to our hotel to swim and hang out around the ground-floor pool. Even all the way across the street from the beach, we continued to cough and sneeze for the rest of the day, particularly while outdoors. While my wife and kids enjoyed the pool, I took a nap on a poolside lounge chair, for the first time in my life. Napping in public isn't my bag, but I was wiped out for some reason. Saturday afternoon, back indoors, we all had a long nap - also pretty unusual for us. Saturday night we went to my favorite local fish & burger joint near the beach. Two of us ate Mahi-Mahi Tacos (mahi-mahi being the Hawaiian name for the "dolphinfish" - which is some other deep water fish, not a dolphin; I heard that they call it mahi-mahi in restaurants because tourists don't find dishes appealing when the word "dolphin" appears anywhere in the name). One of us ate a catfish po-boy, while the others had burgers. So only two of our family of six people ate any Gulf seafood: myself, and my oldest daughter. We are also the two family members with the worst, and longest-lasting, symptoms. I am pale to pinkish generally, and burn easily, so my idea of the best time to visit the beach is before the sun gets too high, and then I want to leave after about an hour, before my freckles multiply to the point that there are more freckles than skin in between them. So, early the next morning we got up, had a quick breakfast, and spent another hour at the beach. Again, there were no warning flags. Few people - a few joggers, mostly, at that early hour. No other swimmers. On that second day, before we could even get to the water, three of us were coughing again. This time I began to make more of a mental connection between the beach and the cough. I realized that we had been awake for about an hour already, and I hadn't heard more than one or two coughs until we got to the beach. Then before we could touch the water, we were coughing frequently again... Something had to be up with that. Why are so many people at the beach sick? I remember watching one couple paddle out on short surfboards, and when they came back in after just 5 minutes or so, both were coughing repeatedly. My wife and I again discussed that there surely must be some kind of environmental pollutant in the air – maybe smog - could smog be so bad that it has now reached Florida's beaches? Or maybe there was a factory discharge of some type nearby? Based on how I felt, I'd say it's something like having the flu, combined with strep throat. Also, my youngest daughter and youngest son both complained of stomach aches that day and the next. It’s just an all-over-the-body, really bad feeling. My appetite was cut in half. I had stomach pains and dizziness, and felt like I was walking through a fog. We just felt lousy all-around. It's a mess of overlapping symptoms, somewhat like what I would associate with radiation poisoning (well...at least as they depict it in works of fiction, like the novel Z for Zachariah, or various fictional Apocalyptic films). That first night back home, after fruitlessly chasing sleep, and coughing uncontrollably late into the night, I finally started my research into our symptoms. Information on the actual cause proved very difficult to find. It was, on the contrary, very easy to find lots of information stating that Florida beaches are supposedly perfectly safe and healthy, and have good air quality, and are fantastic places for families to visit. A dozen webpages on the health issue are buried under a half-million pages asking you to "Book Now!" or "Visit Florida!" Finally, after searching "Tourists sick" along with the name of our beach, I found some discussion on a travel forum about something called “red tide.” In all it took a good deal of searching to locate any information of any kind about red algae or red tide - and then it was just rumors, not, for instance, an official warning. And please note: I perform research and data analysis for a living. So I conclude that this red tide information, which Florida has had in its hands for over 20 years (or perhaps over 100 years), is not well publicized at all. It seems more like it is almost hidden, in places where it is not readily available to the public. Once I knew the name of the problem, well then, sure, it was easy to find out what caused our cough. But without performing this intensive search, I would have concluded that we all just had the misfortune to contract a flu. Not being from a beach town, I had never even heard of red tide. Now that my whole family has had a couple of swims in red tide, well...it's certainly not something I'll ever forget. Red tide is a dangerous condition caused by an imbalance of life in the Gulf of Mexico. When a red tide is present, the water contains an unhealthy amount of harmful, toxic red algae, of one type or of multiple types. Humans should not be near this stuff. It is seriously unhealthy - basically, a toxin, or poison. The presence of red tide in the water means that if you go to the beach, you will be breathing in red algae into your lungs. If you swim, you'll be swimming in toxins. The red tide condition comes and goes, as the levels are greater or lower, from time to time, for reasons unknown. We've been to Florida beaches many times in the past, and never had an issue (to our knowledge) until now. Where Does Red Tide Come From? No one really knows for sure what causes it. An explorer in the 1500's recorded Native American statements about a "red water" that killed birds and fish. Some sources claim there was a red tide in 1793 that sickened some seamen who ate mussels that had the red algae inside them. However, this diagnosis wasn't made until 200 years after the fact, so this could be revisionist history. Other sources say that the states of Maine, New Hampshire, and Massachusetts have seen red tides, off and on, since 1972. However, those sources note that there are multiple kinds of red algae, which have different effects on sea life and on the human body. Florida's first recorded red tide was possibly as long ago as 1844. Sources which claim red tide to be such a longstanding problem also generally try to call red tides a "naturally occurring phenomenon" rather than an imbalance caused by humanity's pollution of the ocean. The very harmful type of red tide we encountered has been a recurring problem on Florida beaches since at least 1998. As far as the type of red tide washing up on Florida's beaches these days, one oft-repeated theory is that this particular scourge of red tide in the Gulf of Mexico may have started with people dumping fertilizer on their lawns (a form madness seen in America, in which people try to force lawns to produce green grass - which they then have to cut, on a relentless schedule, to keep this weed from growing taller than they'd like). The unnatural, harmful chemical fertilizers used purely to grow a useless weed (for decoration) all end up washed down into the sewers and creeks, making their way into the river systems eventually, and from there, they make their way right into the Gulf of Mexico. If lawn fertilizer is part of the problem, I figure the widespread use of chemical fertilizers on commercial farms is a cause as well. Initially fertilizers were used to increase production, and thereby increase profit. But the problem with artificial fertilizer on a farm, delivered from offsite, is that once you start, you really can't stop. Large farms have used so much fertilizer, for so many years, that they are essentially farming dead soil. By that I mean the soil has none of the naturally present, living micro-organisms and microbes in it, which make life possible for the insects, earthworms, and plants (and by extension, other life forms, like birds and small mammals and people) that occupy the land. So, since the farmers' practices have killed the soil, the agricultural industry has to be propped up through the use of more and more fertilizers, which all have to be trucked from elsewhere. At any rate, the theory goes that fertilizers work together to do their thing in the Gulf, and a microscopic red algae (Karenia brevis) absolutely loves the resulting conditions. Either the red algae likes the fertilizer, or some competitor algae doesn't like it - either way, red algae wins. However, one study in 2009 looked at 24 hypotheses for the cause of red tide, and concluded that none of them alone could fully explain red tide. All of those were conducted before the BP Oil Spill of 2010. The red algae bloom spreads around the Gulf, and of course it eventually gets washed up onto beaches. Some sources say this problem is not present in other bays, gulfs, seas, or oceans - only the Gulf of Mexico (thus, potentially at beaches in Mexico, and in the U.S. in Texas, Louisiana, Alabama, and Florida). Other sources say it is, or has been, present on the New England coast as well, and has been detected in other countries from time to time. toxic red algae becomes aerosolized. This aerosolized toxin then travels up to 1 to 2 miles inland from the beach! But let's say your family does what mine did, and you walk right on down to the beach. You're standing there at the spot where the toxin is becoming airborne. This invisible red algae mist sprays all over your body, and right up into your face, and you breathe the toxic life-form into your lungs (is it just me or is this starting to sound too much like a Stephen King horror story?). In short: Red tide is very bad for you. That's a major understatement. The government speak for this situation is, "Red tide can impact the health of humans and animal life." I would translate "impact" to a much more accurate term: "damage," or "harm." The duration and full extent of the health damage is unknown. The government warnings also use the phrase "respiratory irritation" whereas I'd say a more accurate phrase would be: persistent cough of unknown duration, along with potential damage to lungs, nerves, and the neurological system. My research indicates that on the days of our visit, tests for that particular Florida county showed elevated levels of red tide algae (which is not to say that any map alone is an adequate predictor of safety, as explained below). The county was marked in a vivid red on an FWC map - a blood-like color properly associated with danger, and death. It also explains why the water was a murky yellow-brown instead of the famous green/blue color normally found on the Florida coast. "At high enough concentrations, Florida red tide can discolor water a red or brown hue," according to the Florida FWC. Of course, reading lists of symptoms can be a dangerous and pointless exercise. If you flip to any potential diagnosis for almost any condition, you may find that the symptoms all seem to fit: "Hmm, I have a headache...Let's see here now...this book says it's a...Brain Tumor!!! Oh no!!!" I suppose that if you hand a layperson who isn't feeling well a copy of a medical diagnostic manual, within a few minutes he'll likely discover he's a "bi-polar pregnant hypoglycemic with an overactive thyroid, and first-stage leprosy." So yeah, I must admit: I have no medical degree. What knowledge I have is based on reading every article I can find, posted on the websites of universities and governments, about red tide illness. One source said that Hurricane Michael was expected to wash away all the red tide for the time being, while another report released the same week said the same hurricane would just stir up the red tide and cause it to be worse than ever. It's also a major concern to me that no studies have yet been done to track when - or if - people exposed to red tide ever get better. During the 5 day tests they have done, they note that patients "did not recover" their pre-exposure lung function during the test. That's where the information trail ends. it changes the DNA of the lungs. Now, when scientists say "changes DNA," what I hear from that is "possible cancer." Again - these tests were done on rats, and with a very high-dosage exposure. Sort of like the tests that determined cigarettes cause lung cancer. A "change in DNA" is a step on the path to a mutation. A cellular mutation can be benign, and lead to nothing. But not always. Scientists do not yet know whether the DNA damage in the lungs gets repaired, or if the damage leads to mutations. They know enough to say that it appears to increase the risk of cancer (in rats). And that the immune response of the animal exposed to the toxins is decreased. After learning that breathing aerosolized red tide algae causes DNA changes in the lungs (of rats) and may eventually lead to cancer (the logical implication of a DNA change)...well...I'm in a state of shock over what this trip, taken purely for fun and entertainment, may have done to us. There aren't any. Maybe I'm a cynic, but could this be the case because the signs would harm the tourist industry? The first thing that comes to mind is that scene from the classic film Jaws, where the scientist wants to close the beach to save lives, but the local mayor refuses because of what a beach closure would imply for the local, tourism-based economy. "But...Closing Unsafe Beaches is Bad for Business!" "more than $100,000 for Mote Marine Laboratory and $500,000 for VISIT FLORIDA to establish an emergency grant program to help local communities continue to bring in the visitors that support so many Florida families and businesses." $500,000 towards supporting Florida tourism. That speaks volumes about the priorities at play. There's also an additional $900,000 devoted to "clean up impacts related to red tide," and by that they mean, at least in part, the programs by which people (such as prison inmates) go out onto the beach with trash bags and rakes to remove the tons (yes, tons) of dead fish and dead marine life that wash up onto Florida's beaches. Why is the best information available about this posted on the website of an obscure Florida governmental office that most visitors to Florida have never heard of? Would you usually have consulted the "Florida Fish and Wildlife Conservation Commission" website before making your travel booking? I know I didn't. 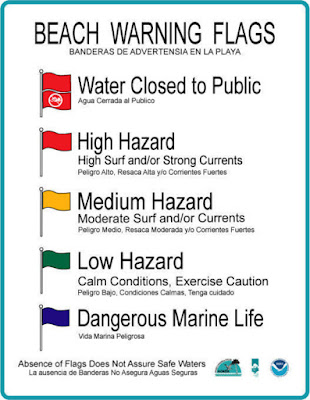 For starters, every single Florida beach access point needs a warning sign, just like the warning signs about riptides. Every Florida tourism website needs to have a red font banner link warning about a possibility of red tide, with a direct link to an updated FWC map of affected counties, along with historical information about past incidents and what sort of symptoms indicate a need to return to your hotel room immediately. Some beaches in some counties have these; while others don't. The one we visited didn't have any warnings. Example of the kind of warning sign that was NOT posted in the county we visited. Why don't all counties have these signs? These beach signs don't need to go up when a bloom is detected, then go back down, then back up, with constant monitoring determining whether the signs should be present. That would imply that the sampling tests done by researchers are accurate enough to predict when it is safe to swim. Instead, there should be a standing notice at every public beach access point: "Florida beaches may have red tide present..."
Upon returning from Florida, I tracked down a government official who manages a red tide program for the county we visited. I wanted to know why there were no warning signs on his county's beaches. His answer was that right now, the state, the county, and the city are aware of the need for warning signs, but they can't seem to decide which of them should be responsible for the posting of notices. They are bogged down in a "discussion" of the "proper procedure regarding the posting of signs." Hmmm. In the picture I've posted above in this article (which I found online), clearly, Sarasota County found a way to warn people, at some point. Every beachfront county in Florida should do the same, right away - not a few years from now. There also needs to be a way to get this information to the public (both inside and outside of Florida) before travel plans are even made. I’m sure most tourists wouldn’t have put much stock in a warning sign, even if there had been any warnings at the beach. Imagine: you invest a day in the car to get there, you burn one or more paid vacation days to do it, you have checked in to a hotel or somewhere already, partially unpacked, and got suited up and sunscreened up, and trekked down to the beach with the whole family...and then you see a sign saying you "might" suffer "respiratory irritation." Would that sign stop you? Or would the sign be too little, too late? By the time a tourist is walking onto a Florida beach, the family has already prepaid hundreds of nonrefundable dollars for lodging. The only time a red tide warning would be any good to the average tourist is before trip reservations are even made. There should be recurring stories in the news on TV, and online, every time a bloom is detected. Instead, a professional researcher/analyst has to spend a lot of time searching to even begin to draw conclusions about the cause of the health damage to his family. Other Florida counties have closed their beaches intermittently this year, and this is where the county we visited has failed to act. What disgusts me the most is that no warnings or signs of any kind about red algae were posted, even on a weekend when the beach should have been closed. Red tide isn't a new crisis - this has been detected in Florida since at least 1998. There has been a failure to act - and this may cause an unknown health damage to me and my wife and four children, for an undetermined and unknowable length of time. I’m certain that there are very large financial interests in the beach towns and counties that want to insist that it is safe to eat the fish, safe to swim on the beaches, safe to visit (and spend money at) Florida’s scenic beaches. I'm unconvinced. It took a lot of effort to find out what the cause of our coughs was. If you search things like "beach air quality," you'll find plenty of sites that give your beach of choice a cheerful thumbs up, with the word "GOOD" proudly proclaimed in a healthful green color. After much research, I believe that two of the more relevant sources of information on this are the Florida Fish and Wildlife Conservation Commission, known as the FWC, which provides maps showing where red tide is the worst, and the National Ocean and Atmospheric Administration, the NOAA, which also has informative webpages devoted to the scourge of red tide, and their own maps. But What do the Red Tide Maps Really Tell Us? Residents: We see a big fish kill! Officials respond: There's no red tide at that beach this week. Reporter: We're investigating multiple reports of red tide. Officials respond: There's only very low levels of red tide this week. Visitors: We're having symptoms of red tide illness. Officials respond: No red tide has been detected in that area this week. Does that mean a Jaws-type cover-up is at work? Nah. I just read that pattern to mean that there seems to be no direct correlation between the detected presence of red algae in samples, and the timing of reports of fish kills or reports of human symptoms. So I am led to the conclusion that red tide maps cannot tell us when and where it might be safe to swim. So, how can we know when it is safe to swim then? This situation is like preparing to cross a busy street full of traffic, while wearing a blindfold. Would you cross anyway? Or stand still, or decide to turn around? Is it possible to know what risks you are taking, while wearing that blindfold? I'll never step foot onto a Florida beach again. We hope this blog helps you with planning your family's travels! Could you help us? Have you ever swam in red tide? Are you better yet? Have you heard of any red tide studies lasting longer than 5 days?